Selamat datang di Portal Publikasi Badan Litbang dan Inovasi, Kementerian Lingkungan Hidup dan Kehutanan. Portal ini menampilkan 16 jurnal ilmiah terbitan Badan Litbang Kehutanan yang menampilkan berbagai topik terkait bidang kehutanan. Beberapa jurnal telah terindeks di DOAJ, CABI, Google Scholar, IPI, ISJD, OneSearch dan beberapa tempat pengindeks lainnya. Indonesian Journal of Forestry Research (IJFR) was first published as Journal of Forestry Research (JFR) on November 2004 (ISSN 0216-0919). The last issue of JFR was Volume 10 Number 2 published on December 2013. 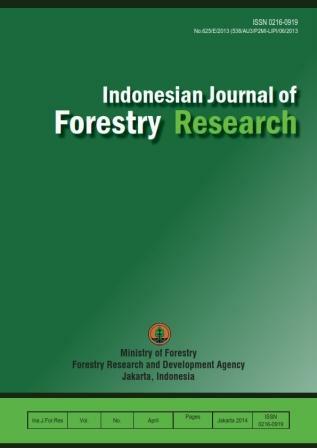 The Journal of Forestry Research has been accredited by the Indonesian Institute of Sciences since 2008. The last accreditation was on June 2016 (accreditation number: 754/AU3/P2MI-LIPI/08/2016) which will be valid until June 2021. IJFR will be issued in one volume every year including two issues which will be delivered every April and October. 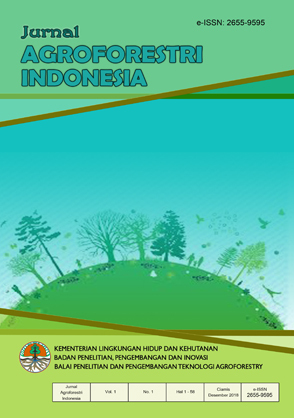 This Journal is published by Research, Development and Innovation Agency (FORDA), Ministry of Environment and Forestry, formerly known as Forestry Research and Development Agency, the Ministry of Forestry Republic of Indonesia. The name of publisher has been changed due to the amalgamation of the Ministry of Forestry with the Ministry of Environment into the Ministry of Environment and Forestry, Republic of Indonesia (Perpres No. 16/2015). Consequently, the Forestry Research and Development Agency was transformed into Research Development and Innovation Agency for Forestry and Environment. The logo of the ministry was reformed, accordingly. Journal of Forest Products Research is a scientific publication reporting research findings in the field of anatomy, physical and mechanical, fiber technology, composite, biodeterioration and preservation of lignocellulosic materials, forest products drying technology, wood sawing and machining, wood and non wood forest products processing, chemical and forest products energy processing, forest engineering and wood and non wood forest products harvesting. This journal has been accredited by Ministry of Research, Technology and Higher Education (RISTEKDIKTI) with Second Grade (Sinta 2) since years 2016 to 2020 as a Scientific Journal (Accreditation Number 21/E/KPT/2018). This journal was first published in 1984 and issued four numbers in one volume every year. Up to vol. 35 No. 4 year 2017, Journal of Forest Product Research is published with frequency four times a year (March, June, September and December). In Volume 36 of 2018, the Journal of Forest Products Research is published with frequency three times a year (March, July and November). This journal is published by the Forest Products Research and Development Center, Research, Development and Innovation Agency, The Ministry of Environment and Forestry. The center was formerly known as the Forestry Engineering and Forest Products Processing Research and Development Center, Forestry Research and Development Agency, The Ministry of Forestry. The publisher's name has changed since the amalgamation of the Ministry of Forestry with the Ministry of Environment into the Ministry of Environment and Forestry (Presidential Decree No. 16/2015). Thus, Forestry Engineering and Forest Products Processing Research and Development Center was transformed into the Forest Products Research and Development Center. The publisher logo has also changed customizing the logo of the Ministry of Environment and Forestry. 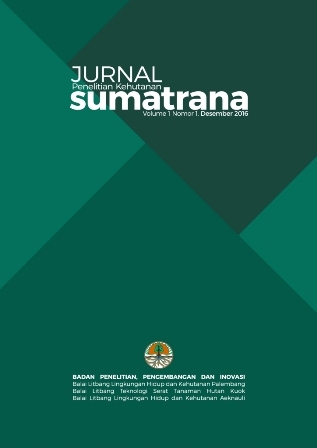 This journal was first published in 1984 as ‘Jurnal Penelitian Hasil Hutan’ with the ISSN 0216-4329. 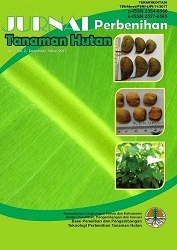 In 1996 the journal name changed into ‘Buletin Penelitian Hasil Hutan’ with the ISSN 0852-1638. 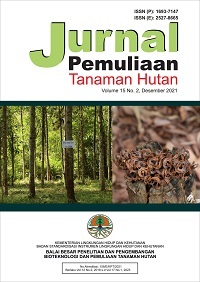 In 2004, the journal transformed into ‘Jurnal Penelitian Hasil Hutan’ with the ISSN 0216-4329. 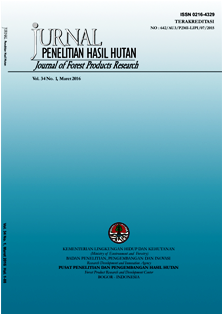 Jurnal Penelitian Hasil Hutan (JPHH, Journal of Forest Products Research) is an open access journal. This Journal does not charge any processing fees or shipping charges. All manuscripts submitted to JPHH under the open access publishing model. In this publishing model, all the papers are through a review process by reviewer and under control of editorial team. The manuscript will be published electronically and can be accessed on our website. Authors can also use the pdf of manuscript which has been published for non-commercial use on personal websites or institution’ sites. Users have the right to read, download, copy, distribute, print, search, or link to the full text of JPHH. Jurnal Analisis Kebijakan Kehutanan (JAKK) is an accredited journal, based on the decree of Ministry of Research, Technology and Higher Education (RISTEKDIKTI) Number 30/E/KPT/2018 with Second Grade (Sinta 2) since years 2016 to 2021. This journal contains scientific papers from research results, scientific assessment/reviews on forestry policy or inputs to forestry policies. First published in year 2004, accredited in year 2008 with number 124 / Akred-LIPI / P2MBI / 06/2008. Up to Volume 13 No 3 of 2016, the Journal of Forest Policy Analysis was published three times a year (April, August, December). Starting at Volume 14 of 2017, the Journal of Forest Policy Analysis is published twice a year (May, November). The journal is published by the Center for Social Research and Economy, Policy and Climate Change, Agency for Research, Development and Innovation, Ministry of Environment and Forestry. The name of the publisher has changed because of the merger of the Ministry of Forestry with the Ministry of Environment, becoming the Ministry of Environment and Forestry, Republic of Indonesia (Presidential Decree No. 16/2015). The publisher logo also changes to adjust the Logo of the Ministry of Environment and Forestry. 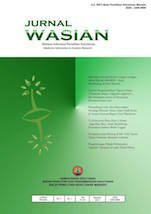 Journal WASIAN contains scientific paper from research result or scientific review in forestry. This journal was issued periodically twice a year (June and December). Journal WASIAN was first issued at 2011 with the name INFO BPK Manado (ISSN 2252-4401), then in 2014 it changed into Journal WASIAN. Wasian derived from the name of the local forestry wood endemic in North Sulawesi, and it also an acronym for Research Information Media. 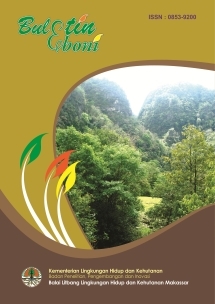 Journal of Plantation Forest Research is an official publication from Forest Research and Development Center; Research, Development and Innovation Agency. This journal publishes scientific articles covering various aspects of plantation forests, such as: germination, nursery, silvicultural techniques, plant breeding, plantation forests protection (including pests and diseases, weeds, and forest fire), forest biometric, silvicultural systems, socio-economic, and plantation forests management. This journal was published for the first time in September 1996, published as “Tree Breeding Research Bulletin” with ISSN 1410-1165. The name change in April 2003 as “Forest Plant Breeding Journal” with ISSN 1693-7147. Finally, in April 2004 the publication changed its title as “Journal of Plantation Forest Research” with ISSN 1829-6327. Initially, it is published three (3) times a year in April, August and December. Since the publication Vol. 12 No. 3, December 2015, the journal is published twice a year in June and December. Journal of Plantation Forest Research is an open access publication, which means all manuscripts submitted to this journal will be processed under open access publishing model. In this system, all manuscripts will be reviewed by assigned reviewer under the control of editorial team. The journal is published electronically and can be accessed freely through our website. Authors are allowed to use the PDF of their publication for non-comercial purposes on their personal and institutional sites. User has the right to read, download, copy, distribute, print, search or link the full-text to this journal. This journal does not charge a processing fee and all the publication process including shipping costs. Journal of Forest Research and Nature Conservation is an official scientific publication of the Forest Research and Development Center, Research, Development and Innovation Agency, the Ministry of Environment and Forestry (MoEF). This journal publishes research papers covering Natural Forest Silviculture, Forest Value, Forest Influence, Botany and Forest Ecology, Social Forestry, Forest Microbiology, and Biodiversity Conservation. Initially, this journal was published by Rehabilitation and Conservation Research and Development Center. In 2015, there was a change in the name of the work unit to Forest Research and Development Center based on the MoEF regulation No. P.18/MenLHK-II/2015 on Organization and Administration of the MoEF. The Forest Research and Nature Conservation Journal is an open access journal, with no cost on both processing and shipping process. All manuscripts submitted to the journal is processed under open access publishing model. In this model, the manuscripts are reviewed by appointed reviewers managed by an editorial team. The scripts will be published electronically and can be freely accessed in the website. The authors are allowed to use the PDF of the published paper for non-commercial use in personal or institution web. Users have the right to read, download, copy, distribute, print, search or link the full text to the Journal of Forest Research and Nature Conservation. 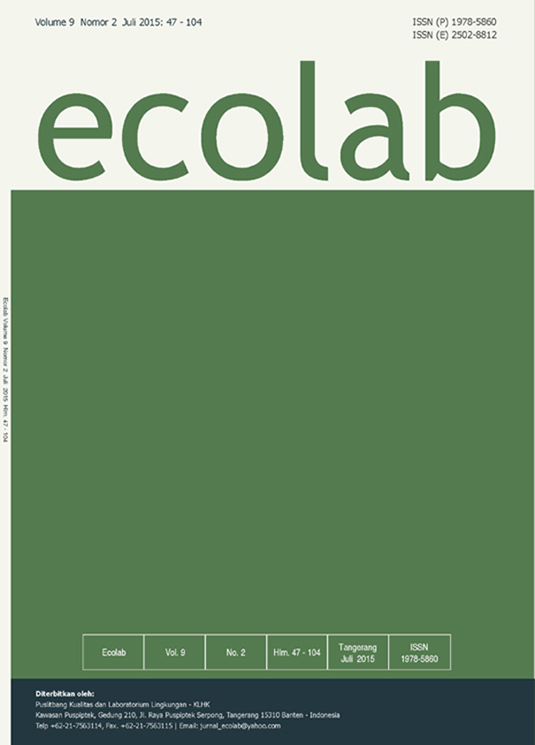 Jurnal Ecolab adalah wadah yang merupakan sarana informasi dan publikasi berkaitan dengan kegiatan laboratorium lingkungan. Penerbitan Jurnal Ecolab untuk menampung berbagai informasi mengenai kajian ilmiah, hasil kegiatan pemantauan kualitas lingkungan dan kegiatan sejenisnya dari berbagai kalangan pemerhati lingkungan. Semoga Jurnal Ecolab dapat menambah informasi kita mengenai perkembangan ilmu pengetahuan dan lingkungan yang ada disekitar kita. Untuk penerbitan-penerbitan berikut, redaksi mengundang pengunjung web, para pembaca, dan praktisi serta pemerhati lingkungan untuk dapat memberikan tulisan dan karya ilmiahnya di jurnal ini. Jurnal Penelitian Pengelolaan Daerah Aliran Sungai (Journal of Watershed Management Research) or JPPDAS, e-issn: 2579-5511, p-issn: 2579-6097) is an official publication that publishes scientific papers of research findings in the field of watershed management. This Journal was published primarily by Watershed Management Technology Center (WMTC) on April 2017. Since the second edition, October 2017, the Journal has been published by WMTC and Soil & Water Conservation Society of Indonesia (Masyarakat Konservasi Tanah dan Air Indonesia) or MKTI. Scopes of the journal are land and vegetation management, soil and water conservation, land rehabilitation, hydrology, social, economic, institutional, remote sensing and Geographic Information Systems (GIS) that support watershed management technologies. Jurnal Penelitian Pengelolaan Daerah Aliran Sungai (Journal of Watershed Management Research) or JPPDAS is an open access journal. This Journal does not charge article processing fees or shipping charges. All manuscripts submitted to JPPDAS under the open access publishing model. In this publishing model, the paper is reviewed by reviewers and under the control of the editorial team. The manuscript will be published electronically and accessible on our website. The authors may also use the published pdf for non-commercial purposes on their personal or institutional website. User has the right to read, download, copy or print of the full text. 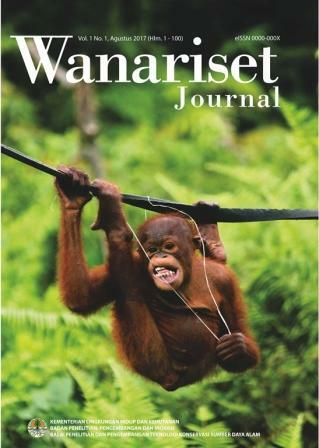 Wanariset Journal adalah sebuah jurnal hasil penelitian dan non penelitian dengan scope konservasi Sumber daya Alam, yang fokus pada perlindungan, pengawetan dan pemanfaatan secara lestari satwa liar, tumbuhan hutan dan ekosistem hutan. Jurnal Agroforestri Indonesia (JAI) merupakan publikasi ilmiah resmi yang diterbitkan oleh Balai Litbang Teknologi Agroforestry. 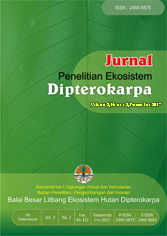 Sebelumnya, Balai Litbang Teknologi Agroforestry sudah menerbitkan jurnal cetak dengan nama Jurnal Penelitian Agroforestry yang terbit pertama kali tahun 2013 dengan nomor ISSN 2355-6366, saat masih bernama Balai Penelitian Teknologi Agroforestry. Mengacu pada Peraturan Kepala LIPI Nomor 3 Tahun 2014 tentang Pedoman Akreditasi Terbitan Berkala Ilmiah, yang mewajibkan pengelolaan karya tulis berkala ilmiah dilakukan dalam format daring (online), Balai Litbang Teknologi Agroforestry menerbitkan Jurnal Agroforestri Indonesia. Perubahan kebijakan dengan penggabungan Kementerian Kehutanan dan Kementerian Lingkungan Hidup menjadi Kementerian Lingkungan Hidup dan Kehutanan, Republik Indonesia sesuai dengan Perpres No. 16/2015, merubah nomenklatur Balai Penelitian Teknologi Agroforestry menjadi Balai Litbang Teknologi Agroforestry sesuai dengan Peraturan Menteri Lingkungan Hidup dan Kehutanan RI Nomor : P.22/Menlhk/Setjen/OTL.0/1/2016, dengan tupoksi penelitian dan pengembangan bidang agroforestri. Jurnal Agroforestri Indonesia memuat karya tulis ilmiah (KTI) yang berasal dari penelitian, pengembangan, dan kajian bidang agroforestri, maupun bidang kehutanan - pertanian yang terkait. Jurnal Agroforestri Indonesia direncanakan terbit dua kali dalam setahun yaitu bulan Juli dan Desember.